The UK stationery market, currently worth £2.06 billion in 2016 is predicted to grow by 2.4% to £2.1 Billion by 2021. This forecast made by retail research and analyst firm Verdict Retail in the recently released report; The UK Stationery Market 2016-2021, highlighted consumer spend on stationery as gifts alongside increased product ranges and design innovation as key growth drivers. 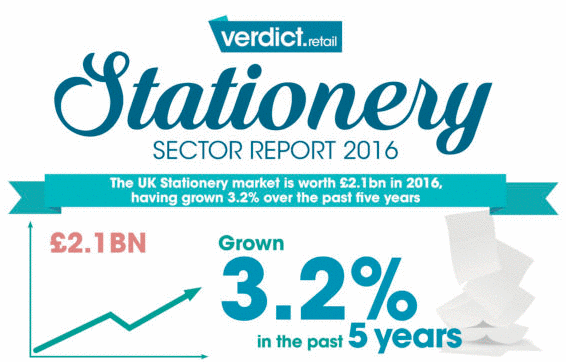 The UK Stationery market has seen consistent year on year growth, cummulating in a growth rate of 3.2% over the past five years. Demand for writing and drawing instruments and accessories experienced the most significant growth, with an increase of 5.9% and 4.8% growth respectively during this five year period. Sub-categories including paper and notepad were identified as "slowing in terms of value" over the same period due to the "ongoing digitisation" and the increased use of technology devices which has reduced the demand for stationery. Associate Analyst Sarah Johns commented, "Increased product choice of premium stationery and availability of extra services such as personalisation mean shoppers are increasingly opting for stationery as gifts." Miss Johns also added, "UK retailers are benefitting from shoppers who purchase stationery for a variety of occasions. For example, stationery is bought for children for the back to school period, for seasonal holidays such as Christmas, and for other occassions such as brithdays and Mother's Day." The report also identified that increased consumer desire for speed and convenience when making a purchase coupled with a reliance on technological devices will see online rapidly become a key transaction channel for most retailers. 9.7% of shoppers surveyed in the report bought stationery online and Competitor Monitor believe that this is an upward trend. Helmut Okike, Head of Marketing at Competitor Monitor said, "The UK stationery sector will become increasingly competitive for two main reasons, consumer ability to make faster purchasing decisions based on the ease of access to the internet anywhere and the relatively low barrier to market entry which has seen players such as Australian based Smiggle enter the UK market with very innovative stationery designs." Mr Okike added, "With the online channel becoming a key revenue channel for intelligent retailers, it is paramount that these retailers become more innovative in product design but also in how they monitor their competition especially around price and promotion which are key purchase decision influencers."